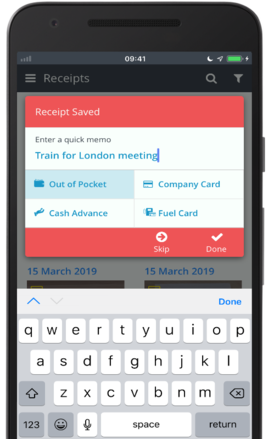 Capture your receipts on the go and let ExpenseIn extract your receipt data so that you can create expenses effortlessly. 1. In your Menu area, tap the Grab a receipt icon. This will open up your phone's camera where you can take a photo of your receipt. Please note: If you take a photo of multiple receipts, we cannot scan them. In addition, we will only scan receipts that have not yet been attached to an expense. 2. Add a memo to your receipt as this will populate the description box when you create the expense. 3. 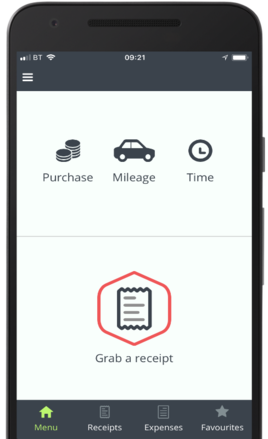 You can choose the Purchase Method of the expense. Tap Done to add that receipt to your account. The receipt will be sent to your Receipts section. You can create an expense instantly but we would suggest waiting for the receipt to be scanned first. Once a receipt has been scanned it will have a yellow scanned label on it. Create an expense from your receipt by tapping Expense. If you have any receipts that have been sent to your email address. 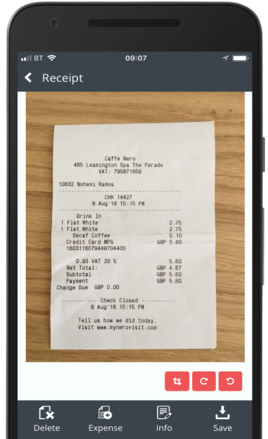 You will want to check out our email-to-receipts feature to get those receipts sent to your account. 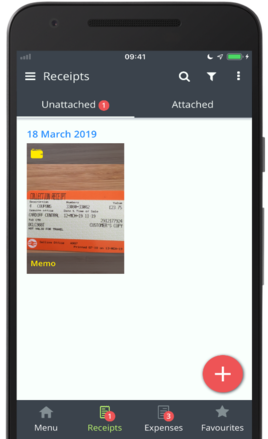 Please note: If your finance team upload card statements on your behalf, do not create expenses from these receipts as you will create duplicates. Add an emailed receipt to your account by using our email-to-receipts feature.